Imagine the mental gymnastics necessary to believe something so fundamentally absurd. I took a decent dive into this book about "nothing" by a leading cosmological thinker, but is was a long time ago. There is a lot of developed thought on the subject - and I am surprised at the "gee whiz" here on this forum. Or - you can say that "nothingness" that is outside time and space - is Physical. Either way, there exists a "physical" paradox in the minds of men, yet nature performs perfectly and originated just fine. Or - you can say that "nothingness" that is outside time and space - is Physical. If it exists, it's not Nothing. It's Something. This is the problem with many attempted explanations - they rely on redefining nothing as something as Dawkins did. It is either something or nothing - let's bear in mind the reasons why we invent and use language! Does the Civil War "exist". Materialistically, is does not. However, it does exist as information. If information is something, then it cannot by definition be nothing even if it is not an object. So where did the information come from? As best as I understand, informational activity comes from two primitives, just as physical activity comes from material and energy. In the case of information the primitives are "real-world meanings" and the formal connections that link their possibilities. Units of measure of matter and energy are split into names that form two categories. Formally; information science and the equations of communication theory and thermodynamics have units called bits measuring: "formal connections that link their possibilities". It is "real world meanings" that our current science has not parsed into measurable of units. Here linguistics comes to play, as you have said. So does logic. The Civil War is over. We could measure the Civil War and document the information it manifested, like - how many died and where the battles took place, when they happened. So the information coming from the activity of the Civil War is the part of whole that including the physical materials and forces deployed. Another part of the whole is the instructions, communications, strategy, intelligence gathering and military organization. My point is through information science we can "measure" the past and the Civil War - which to us - is a body of information that is real and exists. It just exists in information space (infospace) not in physical space. The Civil War has left physical space behind as an activity. How can we measure "how real"? The information objects of the past, like the Civil War, can influence probabilities of the here and now and the future. Knowing is measurable. Is a recovered artifact from the war - the Civil War itself? No. Can it tell a narrative that affects minds in the future when studied? Yes and in this activity causal information from the Civil War is brought to the present and future. It's too simple. The CMB is a curiosity in itself. My general feeling is that physics has to return to much more local concerns. Worrying about the origin/fate of the universe is just silly because the theories aren't settled and the data is pretty tenuous. I have no ideas what tenuous data means, other than the measurement equipment is being re-calibrated and revised data is expected. The CMB has been studied intently and its natural data has been measured and graphically represented The "picture" is seen as an information rich signal. Information is real unless you think the words you typed above do not exist. Your map rests upon the erroneous supposition that Red Shift is an accurate measure of a star's movement. Your map rests upon the erroneous supposition that Red Shift is an accurate measure of a star's movement. It is not. Red shift is not a measurement technique, it is an error-correction algorithm. RS is a calculation based on a data models; the above picture is empirical data captured by a measurement technology. Both the light measurement by the Plank team and the red shift correction computation are evaluated as to their potential margin-of-error. The measurement equipment captures a reflection of a natural signal. The "picture" is the most accurate ever taken. The picture is not "tracking stars", it is a snapshot of the natural light energy. The current red-shift algorithms are surely not exact, for all celestial signals recorded and maybe there are other unknown variables to be accounted. Better versions are sure to come. What do you think is wrong with current version? Honestly I am not sure the Plank map is corrected for red-shift at all. I have praised the math and its developers, which supported the theories of the CMB and the Big Bang. I have also said that the science I understand can offer a conjecture about the state of affairs before physical reality manifested. Before the singularity of physicality, there was a real-world probability for the event as evolving structured information. (like virtual events) Logically, it is hard to deny that before the sequence of events thought to start the Big Bang - was a "probability wave" organizing itself for interaction with time and space.. Here is an excellent presentation of the Plack map. the above picture is empirical data captured by a measurement technology. The problem is not the accuracy of the collected data. The problem is your map rests upon the erroneous supposition that Red Shift is an accurate measure of only a star's movement. * High redshift galaxy-like systems apparently associated with low redshift clusters. You cannot continue to ignore this data that proves something is fatally wrong with your Big Bang Theory and dance off into ad hoc math-magical La-La-Land to patch it up with esotericism. I am too. It makes more sense than gravity alone. Astrology is so easily refuted by gravitational relationships, but the EUT might explain why so often astrology seems to work. Among other things. There are two ways to talk science, narratives and math. Talking math, leads someone thru the variables and units of measure and therefore, logical opinions can be formed. Redshift may have a "story" to tell for some - but for me it is a derived "z variable" referring to spectrographic analysis, Redshift computation is abstract and is not about direct movement of objects. It is about changing frequencies of optical data. Redshift is an error-correction set of equations that can qualitatively estimate a pattern of changing frequencies and describe a photon's history. There are 3 separate kinds of redshift, are you sure all your points are referring to the same set of redshift equations? The formula for redshift should remind you of the process where you calculated your percentage error: [(your value) - (true value)] / (true value). Cosmological Inflation is under serious attack, with the new data from Plank. (the article I linked touches on the subject.) I don't see any papers seriously challenging the BB in 25 years. If you have someone who speaks the language of science who supports you views - simply cite them, rather than share a political rant with no facts to examine. Right, and what the late Halton Arp claims is that there is an association between high redshift objects and galaxies with a much lower redshift. Logically, if the redshift can be translated into distance away, that cannot be possible. Halton Arp's followers believe that Hubble's 'law' is not responsible for these high redshifts. Incidentally, HA was a former student of Hubble - not just a nobody. If that association is valid, astronomy is in big trouble because distance measurements - particularly large ones - may be grossly incorrect! Distance, measured as a function of light emission, is an indirect measurement. It is easy to think of "distance" as an absolute, because in our physical spaces we can directly detect distance with a tape measure. Space/Time is said to be fabric-like. In cosmological "distance" how much are they waving and warping, we just don't understand. Add to that; the use of a calculus of red-shift correction to get a "true" distance - is like-wise very flexible and may have a very large margin of error. Thus, increasing the blurriness of the picture, rather than clarifying it. That inter-galactic distances could be highly inaccurate is to be expected. Arp appears to be a data-collecting guy, as much as a theorist and therefore, my kinda guy. There is something not correctly modeled about quasars and to your point, there are perceived problems with relying on a red-shift method of distance approximation, thinking it is a physical property, rather than a heuristic. 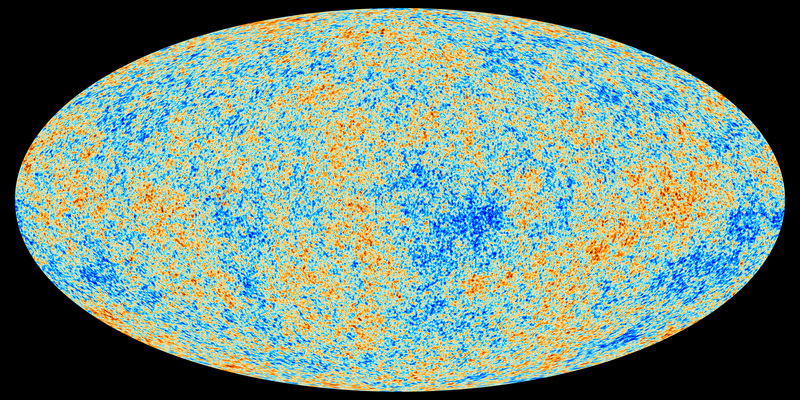 However, the CMB is a natural phenomenon and it is data-laden. It speaks to a idea of a dramatic moment in the physical history of the universe. It is not a theoretical event. It is not a thought-experiment. Does CMB + relativistic equations = BB? I am sure not qualified to comment on whether its right or wrong. I am very positive as to the analysis of what event caused the CMB. The CMB was created at a time in cosmic history called the Recombination Era. The universe had cooled to a temperature of about 5,000 degrees Fahrenheit (2,700 degrees Celsius), cool enough for electrons and protons to “recombine” into hydrogen atoms. Photons were released, and today this radiation is called the CMB. Before the CMB there was no physical processes as we know them, without the elementary particle exchanges creating radiation. The birth of escaping photons marks physics starting, IMHO. My informational realism comment to that is: BEFORE the CMB there were non-zero values for a probability wave (information object) that could "collapse" into physical light @ a fixed speed. Maybe there was 10 - or "10 to the 10 "- universes in superposition - who knows. But; this one has light because before there was light was a real-world probability for light. Halton Arp isn't talking about a little blurriness, but potentially a huge error. Quasars that are assumed to lie at the edge of the known universe because of their redshift, may be at about the same distance as galaxies that are much closer to home! Of course, the absolute luminosity of a quasar is believed to be enormous because of its distance. If quasars lie closer in, they will be much less energetic.